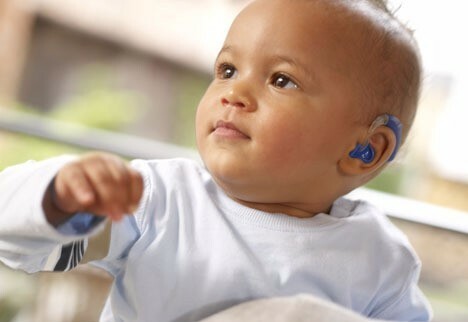 Hearing loss can occur at any age, however, hearing loss from birth or that develops during infancy and the toddler years can have serious consequences. Normal hearing is essential to understand and learn spoken language and to learn how to produce clear speech. However, if a child experiences hearing loss during infancy and early childhood, treatment is critical to ensure language development. Even a temporary hearing loss during the infant stages can result in delayed language development for a child. Most children experience mild hearing loss when fluid accumulates in the middle ear from allergies or colds. This hearing loss is usually only temporary (conductive in nature). The normal hearing resumes once the symptoms subside and fluid drains out of the middle ear. For 1 in 10 children, the fluid may stay in the middle ear after the infection clears up. These children don’t hear as well as they should, and sometimes have delays in speech. This type of hearing impairment is caused by an abnormality of the inner ear or the nerves that carry sound messages from the inner ear to the brain. The loss can be present at birth or occur shortly thereafter. If there is a family history of deafness, the cause is likely to be inherited (genetic). If the mother had rubella (German measles), cytomegalovirus (CMV), or another infectious illness that affects hearing during pregnancy, the fetus could have been infected and may lose hearing as a result. The problem also may be due to a malformation of the inner ear. Most often the cause of severe sensorineural hearing loss is inherited. In most cases of pediatric hearing loss, there is no family history of hearing loss on either side of the family. Hearing loss must be diagnosed as soon as possible so children do not have a delay in learning a language. The Otoacoustic Emission Test measures sound waves produced in the inner ear. A tiny probe is placed just inside the child’s ear canal, which then measures the response when clicks or tones are played into the ear. If these tests indicate that your child may have a hearing problem, you should have a more thorough hearing evaluation done as soon as possible to confirm whether your child’s hearing is impaired. The ABR (Auditory Brainstem Response) which measures how the brain responds to sound. Clicks or tones are played into the baby’s ears through soft earphones, and electrodes placed on the baby’s head to measure the brain’s response. This allows the doctor to test your child’s hearing without having to rely on her cooperation. If you believe your child has a hearing loss, please come to our office in Peoria, Mesa, Scottsdale or Surprise to meet with one of our audiologists. Timely diagnosis and treatment will provide the best possible outcome for your child.